In Mucha Jour tapestry, we see the woman by day "Mucha Jour" from the Les Heures Du Jour or 'Hours of the Day' series from 1899. This Czech artist literally defined the Art Nouveau movement with his distinct paintings and works depicting the seasons and the hours of the day, personified by women. In this tapestry we see the woman, fully awake, at daytime, surrounded by flowers as she is suspended in the air. The softness of this series from the 'Hours of the Day' which includes the afternoon, evening and night, is portrayed by the gorgeous use of pinks and blues. 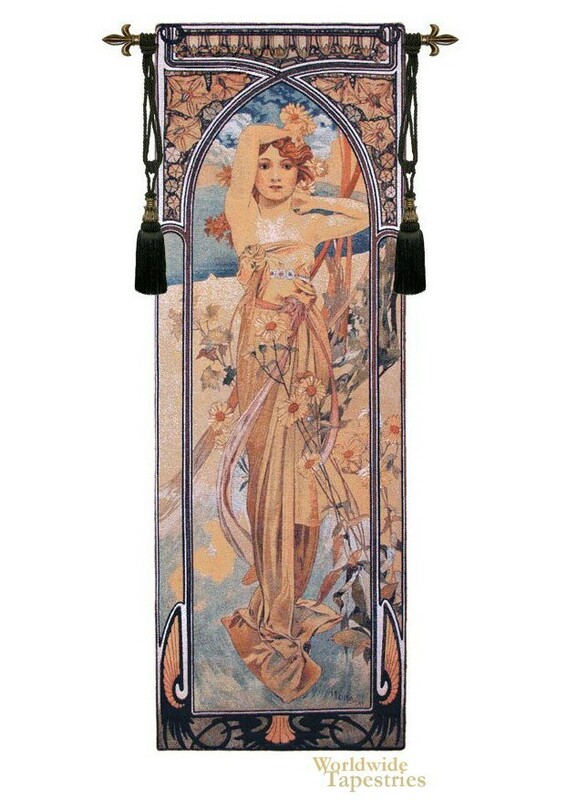 This art tapestry "Mucha Jour" is backed with a lining and has a tunnel for easy hanging. Note: tapestry rod and tassels, where pictured, are not included in the price. Dimensions: W 14" x H 38"
Dimensions: W 21" x H 61"
Dimensions: W 27" x H 74"